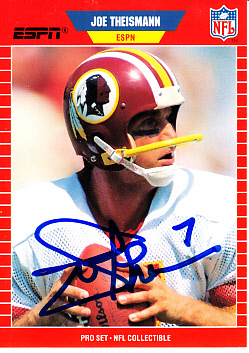 1989 Pro Set Announcers football card autographed in blue marker by Washington Redskins Super Bowl winning quarterback Joe Theismann. Obtained in person at celebrity golf tournament. With certificate of authenticity from AutographsForSale.com. ONLY 3 AVAILABLE FOR SALE.